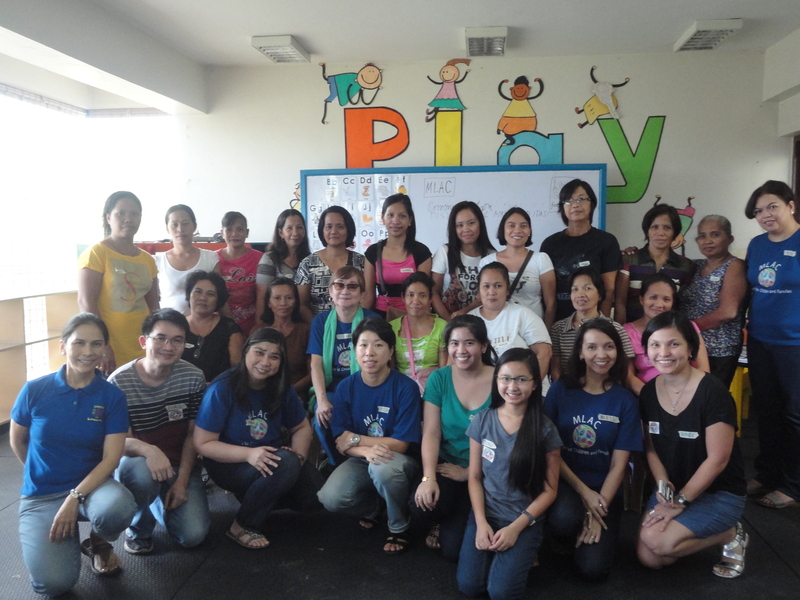 On May 24, 2014, MLAC Psychosocial Services in partnership with the LINKS School for Life in Barangay Tumana, Marikina City, welcomed mothers for a morning of learning and sharing as Dr. Honey Carandang delivered a talk on parenting. 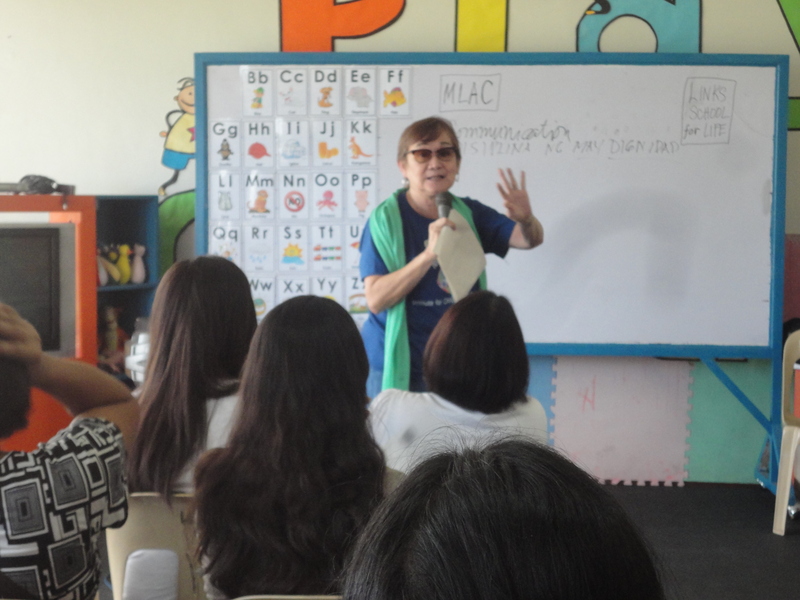 Entitled “Parenting is Nation Building”, the seminar was all about answering the question, “Paano maging mahusay na magulang?” This activity was organized by MLAC team member, Ms. Marisa Marin with Dr. Cecile P. del Rosario, Head of Links School for Life. The parent participants of the workshop. Dr. Carandang began by saying that to become a parent, the only requirement is to have kids. Often, the guides that parents have in raising children are limited to their own mothers and fathers. To be able to shed light on this concern and answer the aforementioned question, she provided guidelines on how to be an effective parent by discussing several tips and areas for consideration. The first was communication. She emphasized that talking shouldn’t just be of good quality but must be effective as well. She mentioned how scolding kids can be done better by reframing statements and omitting the insults one might say towards the child. The second was discipline with dignity, wherein clarity, consistency and consequence were emphasized. It is important for a parent to ask the child directly if s/he was clearly understood; to be consistent in what behaviors garner a reward or a punishment; and to make the kids aware of the consequences of their actions. Modeling was also highlighted to remind parents that they serve as the role models of their children. Magsabi ng totoo or tell the truth was another point focused on. Often, children are belittled because of their young age; when in reality, they know what is right, and they know how to think and tell the truth. Instances of child abuse were shared by Dr. Carandang, in which she stressed the involvement of the entire family in such incidents. In order to change the behavior of abuse, people should change their thinking towards it. Children should be respected and their dignity, protected. Dr. Carandang giving her talk to the parents. The fourth point was magkaroon ng regular family bonding. Dr. Carandang pointed out the significance of family bonding since these create moments that can be carried on to the next generations. Participants were able to share some of the activities they do with their families, which included dancing, singing, asking questions, talking to each other and sharing stories. Enjoy your children was another guideline discussed. Carrying over from the previous point, moments were said to be a legacy that parents may leave behind. Having these shared experiences with the family sets a foundation for them no matter what happens. Aside from this, the importance of play was also stressed. It is within a child’s nature to play so parents should allow them to do so. The next point was find a support group, wherein Dr. Carandang said that support can be received from various people: a spouse, friends, churchmates, and teachers in school. The final point was take care of yourself, wherein it was emphasized that children also want to see their parents happy. If the parents don’t take care of themselves, the children may end up trying to find ways to take care of their parents. 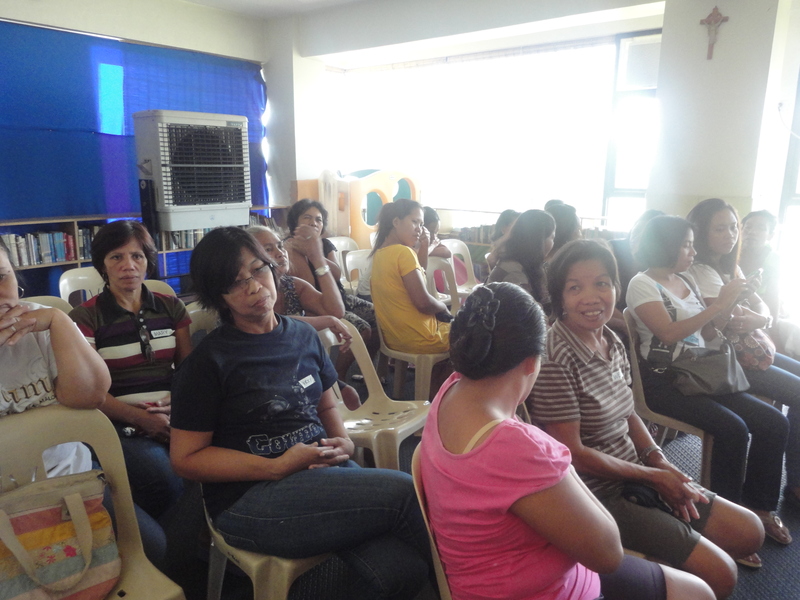 Dr. Carandang reminded the mothers that they deserved to take care of themselves and be happy. After these points were shared, an open forum followed. Various questions were asked such as how to encourage a child who does not like making mistakes; how to deal with children who stopped their schooling; and how to discipline children when their grandparents spoil them. Dr. Carandang answered these questions with suggestions that went back to the basic principles she previously discussed. After the open forum, the participants were divided into small groups to share their thoughts and reactions about Dr. Carandang’s talk. It was also a way for them to ask questions and to talk about their own experiences as parents. Each group was assigned an MLAC team member as a facilitator. There were six groups, with about three or four members each. The groups were comprised of women of various ages. The participants were asked two questions. First, “Ano ang pinaka-mahalaga?” Then for the second one, they were asked “Pag-uwi niyo sa pamilya niyo, ano ang mababaon niyo na puwede niyong magamit sa inyong pamamahay at sa inyong mga anak?” The parents participated actively and shared their personal experiences. Some gave similar responses and concerns about their children. Most of the participants said that discipline, communication, and pagpapahalaga sa sarili were the important ones. It is necessary to ask the child if s/he understood everything that was said by the parent. Also, it is important to know which type of discipline is best, because most kids prefer a discreet way of disciplining, rather than the ones that seem too harsh. The concept “anger management” was also raised during the open forum. Lastly, the parents learned that they should try an eclectic approach in disciplining their children, to know which one works best for them. Moving on to the second point, the participants said communication is also essential. Whenever parents scold their children, they should keep in mind that everytime they say the old idea of “Bata lang ‘yan, wala pang kaalam-alam”, it could be insulting to the kids. Instead, they should acknowledge the fact that they have feelings too and that they should be treated with respect. The parents also said that the talk helped them realize that instead of just scolding their children, they should also magnify their strengths, not just their weaknesses. And lastly, according to the parents and the facilitators, the most important thing is to take care of yourself. Most of the participants said they initially thought they should only give their time to their families, but they were proven wrong when Dr. Carandang said that children actually want their parents to be as happy as they are. Another point they learned was that the happiness of their children is a reflection of their happiness. According to one of the parents, the talk taught her that “Ang pagpapahalaga sa sarili ay mahalaga upang mapahalagahan ang buong pamilya”. 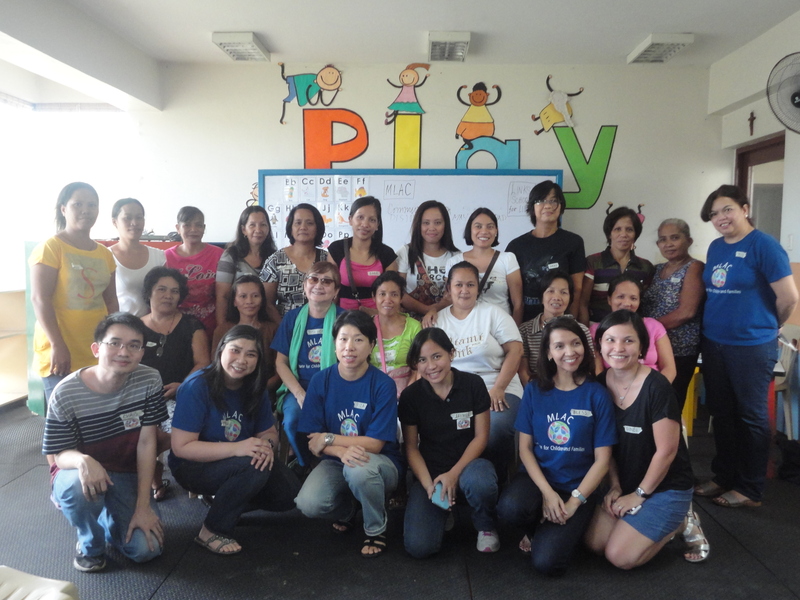 MLAC Team members, Dr. Cecile del Rosario, and the participants, with us. The small group sharing allowed the mothers to express their realizations about their misdoings and share the ways they can improve themselves. Dr. Carandang ended the seminar by repeating all of the main points and thanking the participants for sharing their own stories and experiences as parents. Everyone went home feeling “full” and happy. * Alleana and Toni are our adopted MLAC members who have so kindly volunteered their time with us to document this project. Many thank to you both for the photos and this beautiful article! Next Want to be a happier and more effective Carer? May I ask for the contact address of Dra. Honey Carandang. Thanks very much. God bless you more. Hello po here are our contact details. Better to set an appointment first po though since Dra.’s sched is usually full. Thanks!